This is the third instalment of my #SeriousWriters blog interview series which discusses the lifestyles, advice, and opinions of people who are serious about writing. 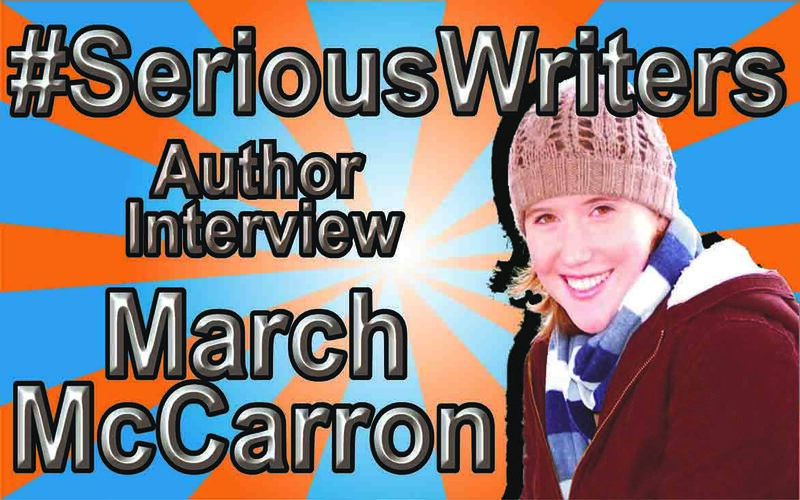 This time, I invited bestselling Amazon author, March McCarron, for an interview in which we talked about her writing progress, her triumph in gaining book reviews, and the phenomenal success of her Marked series. Dan: Hi, March! Could you start by introducing yourself and telling us a bit about your work? March: Hello, all! I’m March McCarron, an indie fantasy author. My two published novels, Division of the Marked and Elevation of the Marked are the first half of a four part fantasy series. The books are about people with superhuman abilities in a pseudo-Victorian setting, full of martial arts, mystery, and romance. Dan: What is your writing schedule like? Do you try to hit a certain word count every day or does your productivity vary depending on your mood? March: I frequently try to set goals for myself, but ultimately I’m not terribly concerned with word counts. Some days I’m able to write more than others, which is fine with me. Sometimes a “less productive” day will produce a better written scene, which will ultimately require less editing. So, I figure there is no one simple way to measure a day’s success. Dan: Did writing your first book expose a lot of gaps in your knowledge? March: As far as knowledge of the craft of writing goes? Certainly! I really had no idea what I was doing with that first book. I learned how to write a novel as I went, usually by getting it wrong and trying again. I recall feeling insecure about pacing and the flow from scene to scene–I was confident in my story on a macro level and I knew, with time and effort, I could write well on a sentence level, but the parts of storytelling that exist between those two things were, for me, difficult in the beginning. Dan: You currently live in South Korea for work. Have you always been fascinated by Asia or was your Marked series inspired by the move? March: I always had a strong desire to see and experience Asia, and I have always been interested in martial arts, though specifically Chinese martial arts. I chose to model one of my three kingdoms after Korea simply because I wrote the book here, and I thought it would be a nice nod of the head to the country that’s become a home to me. However, I’ve learned much more about Korean history, culture, and language since I did worldbuilding for the Marked series. I’d love to write something in the future that is inspired by Korea in a more significant way. Dan: I believe you work to music. Does this mean you can shut out the world and work anywhere or can you only work productively in a specific environment? March: I write almost exclusively in cafes. I find that I’m never terribly productive if I try to write at home–I need that sense of ‘going to work.’ I usually listen to music with noise-canceling headphones–it helps me shut out the world, as well as choose my music more deliberately. K-Pop isn’t usually quite the mood I’m shooting for. Dan: On your blog you say you’re not much of a plotter, but you use tools like Scrivener and Aeon Timeline to organise yourself. Are your revisions particularly heavy because of this? March: I’m not sure what is typical of other writers, but yes, I do fairly extensive revisions. In both novels, though more in the first than the second, I had to do a lot of rewriting in draft two. This method will probably mean that I’ll never be a terribly fast writer (I marvel at how often some authors are able to publish), but it is the method that, in my case, will produce the best book in the end. Dan: Most new writers struggle to get honest reviews, but you’ve managed to gain well over 100 on Amazon. How did you get so many reviews and how important would you say they are to indie writers? March: Getting reviews on your first book when you have no readership is a real challenge–the good news is that it gets easier from there. Reviews are important, but they aren’t the end-all-be-all that some indies seem to think they are. If a book isn’t visible, it doesn’t matter how many reviews it has. That being said, many marketing strategies–like Bookbub or Ereader News Today, for instance–require a certain number of reviews, and readers certainly feel more comfortable purchasing a book that has been vetted. Early on, I offered free copies on various Goodreads groups in exchange for reviews–with middling results. I also attempted to contact book bloggers, and had some success in that area, though not right away. I participated in author exchanges, but only if the reviews were non-reciprocal and honest. I didn’t want, nor was I ethically ok with getting, a slew of generic 5-star reviews from people who a.) hadn’t read the book, or b.) wouldn’t criticize out of fear of retribution. Readers are smart enough to tell the difference, and a few critical reviews help more than they hurt. Getting my earliest reviews took a lot of time and work, but the majority I have now came from readers who were just kind enough to offer their feedback. I gained a lot of reviews after a free promo. My second book has thirty-some reviews without much effort on my part, aside from a note at the end asking readers for their thoughts. Dan: Increasingly, writers are collaborating on novels to gain readers. What are your thoughts on this? March: I think that it makes a lot of sense from a marketing standpoint, to pool readerships, and if a group of writers work well together, they can potentially create something better than any one of them could have produced independently. One of my all time favorites is Good Omens by Terry Pratchett and Neil Gaiman. I don’t think I, personally, could collaborate, however–my process is too unorganized and I’m a bit of a control freak. Dan: What is your best tip for new writers? March: Don’t be afraid to write a terrible first draft. It’s easy to quit, when you feel as though the thing you’re putting all of your time into is utter garbage. Don’t. The quality can come later, draft one is about finding your voice and feeling out the story. Dan: Do you have any big news or new projects you want to share with us? March: I’m working on the third installment in the Marked series, so nothing new and exciting just yet. I’ll have to finish this story up before I can try my hand at something different. March McCarron is the author of Division of the Marked and Elevation of the Marked, the first two instalments of the epic Marked oriental fantasy series, both of which have had rave reviews and received over 40,000 downloads. March is currently running a $0.99 promotion for Division of the Marked on Amazon. To take advantage of that deal before it ends, or for more information about March, follow the links below.